This sermon was preached on April 7, 2013 at the First Presbyterian Church of Ashland. My primary text was John 20:19-31. Our Gospel passage today picks right up from where the story ended last week. 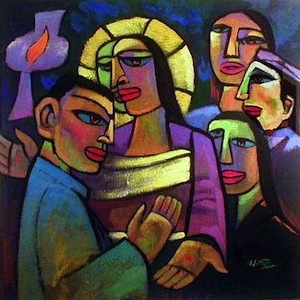 In John’s version of the story, Mary Magdalene had gone to the tomb, seen the stone rolled away, told the disciples, went back to the tomb and ran into a gardener…who turned out to be Jesus. She then went and told the disciples what Jesus had told her, and that’s where we pick up this morning. The disciples had essentially been hiding out behind locked doors…they didn’t know what to think about the fact that the stone had been rolled away and that Jesus’s body was gone…they thought someone might be coming after them. And so they hid out. Behind locked doors. Waiting…we’re not really sure what they were waiting for. Maybe for things to die down…maybe for someone to come and tell them that they weren’t under suspicion of anything, we don’t know. But they were hiding. The text doesn’t tell us that he knocked on the door…or anything at all about how he came to be standing there among the disciples. As you heard this story, you probably get the image of a ghost-like Jesus suddenly just…appearing…to the disciples. And obviously, I wasn’t there, so I can’t tell you how that all played out, or how exactly it was that Jesus showed up…or whether it was Jesus as a spirit, or if he had a type of body…but, nevertheless, there he was. With his disciples…minus Thomas…maybe he was sent out on a pizza run? Who knows. And Jesus probably knows that they’re going to be a little unnerved by all this…and might have some questions, so he shows them his hands and his side…just so that they would know that it’s him. It is their teacher, their spiritual leader, the one who had a spear stuck into his side, and nails hammered through his hands. And what happens next seems to be…a commissioning of sort. He’s clearly not going to be around for long…and so he’s commissioning, empowering and sending out these disciples of his for ministry. He breathes on them, gives them the Spirit, and empowers them for a ministry of forgiveness. I think we’re supposed to be reminded of all of these passages – I think that’s something John did on purpose when he tells us that Jesus breathed on them and told them to receive the Holy Spirit….just as God breathed life into the first creation…and as the Lord God breathed life into those dry bones…Jesus breathes new life into these disciples, these broken and weary and fearful disciples…many of them had probably been doubting Jesus, were doubting much of what he said, because it appears that he had been killed…even though they heard from Mary that he was risen…could they really believe it? And then Jesus shows up. Their eyes are opened and they see his hands and his side…they are able to see the risen Christ, and receive the new life breathed on them…the Holy Spirit. Well, all of the disciples except Thomas. Can you picture the scene when he arrives back at the house? There it is. Poor, doubting Thomas. Sad, Thomas the doubter. Thomas just did what ANY of us what do, didn’t he?! He wanted to be able to see Jesus with his own eyes…he wanted his eyes opened, as the eyes of the disciples had been…to this new reality of Jesus, the Risen Christ. And so…Thomas did what many of us have done in similar situations. And after waiting for a whole week….after sitting with his doubt, with his questions…wondering why Jesus would show himself to the other disciples, but not to Thomas…Jesus arrived. Brought peace. And let Thomas have the same experience that the other disciples had been blessed with a week earlier. And then Jesus says, “Okay, sure. Do that.” Or perhaps there is something quite mysterious about the Risen Christ. The Risen Christ, who, while not visibly-present to Thomas a week earlier, still knows Thomas’s heart, knows what Thomas needs to believe…still knows what Thomas said to the other disciples. Jesus says to Thomas “Do not doubt…but believe.” But to be honest, that’s not a great translation. The Greek in that text essentially says: “Don’t be unbelieving. But rather, believe, have faith.” It’s possible it’s just a bit of a game of semantics here, but I think there is a difference between unbelieving and doubt. I don’t think you can believe and unbelieve at the same time, and I think that’s what Jesus is talking about. But you can believe and have doubt at the same time. For, I think that pretty much describes the bulk of our Christian journey. And many of us still have doubts. That doesn’t mean we don’t have faith…that doesn’t mean we don’t believe…but we do still have doubts. 1 Corinthians 13:12 says: “For now we see in a mirror, dimly, but then we will see face to face.” Things might not be all that clear to us now…sometimes they may be a little fuzzy…but I think the encouraging thing is that at some point, our eyes will be opened. Every eye will see him. …sometimes we’re feeling more like Thomas. Feeling like we missed Jesus…and that we just have to sit around and wait for Jesus to show up again…sitting around with our doubts, with our fears…and just not quite feeling as sure as the disciples may have felt. And I think the good news for us in this story is that Jesus shows up again. Thomas and the disciples didn’t know that Jesus would show up again, but Jesus does. A week later, Jesus surprised them by just appearing again in the house behind the locked doors. He brings them peace, encourages Thomas’s faith and gives Thomas exactly what Thomas needed to believe. Jesus isn’t thrown off, or upset, or irritated with Thomas’s doubts. But he reaches out to him in just the way that Thomas needed. That sounds like good news to me…that God will show up. Meet us where we are. That God will accept us just as we are, with our doubts, our questions, our faith…all of it. And in just a few moments, when we celebrate communion…we create a space where God shows up. And while we don’t understand the mystery behind the bread and the wine, we participate in this act of remembrance and of hope, that God shows up and meets each of us wherever we are on our journey. Adam…I think you are one heck of a preacher…this is coming from a 72 year old grandmother!! !